Need an Affordable Office Waste Removal Service in Sydney? We Offer The Friendliest Service at The Best Price. Call Us! If you manage or work in an office, you’re probably aware of how easy it is to produce a lot of rubbish. In an ideal, perfectly efficient world, there would be much less, and it could be reused or recycled. 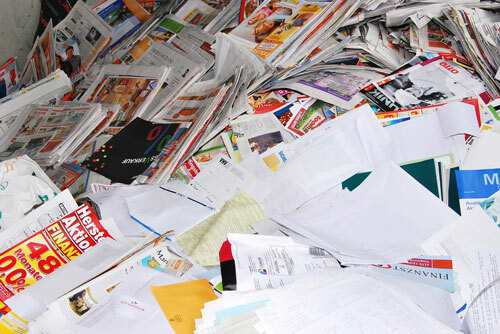 On average over half of office waste is paper or cardboard. These items are at least recyclable, however, it is surprising we still produce so much of these products in the 21st century. Hopefully you’re already doing what you can to reduce the waste of these items - printing double sided, emailing instead of posting where possible, having a scrap paper pile, etc. With paper and cardboard also consistently producing junk, you’ve probably got suitable systems in place to dispose of this weekly. However, sometimes the bins may fill or overflow with more than just paper, and the weekly rubbish system may not quite cut it. It may be an end of year cleanup, changing of staff, system upgrades, etc. that may cause you to have more junk than your weekly disposal system can deal with. Occasionally large amounts of e-waste can build up, which is another common commercial rubbish problem. This is why Same-Day Rubbish Removal are here to help. It may be a new set of computers for all staff, and all the old electronic equipment has made its way to a pile in the corner. An employee may have left short notice leaving years of equipment and materials that is not needed by anyone. Maybe it is the end of the year and everyone has decided to have a good clean up and simplify their work space. You’re probably too busy to try and deal with these trash problems yourself, it can be a time consuming and costly process; Same-Day Rubbish Removal are an easy, stress free, and affordable solution to whatever junk problem you may have. At Same-Day Rubbish Removal we believe that we offer the best junk removal service in Sydney. We guarantee that you will be completely satisfied with the service that our friendly team provides. There’s not much that our team haven’t come across when it comes to rubbish removal. You may be embarrassed by the amount of garbage that you have managed to accumulate, but there is no need to worry, our experienced team will be more than happy to remove it all fast and efficiently. We will be sure to clean up thoroughly after ourselves, not leaving a spot of waste for you to worry about. The best part of our service is that you don’t even have to lift a finger – just tell us what needs to go and we will take it. Same-Day Rubbish Removal doesn’t only specialise in office junk removal, we do commercial jobs and also offer our service to household/residential rubbish removal jobs as well. Whether you're in Mosman on the North Shore, Woollahra in the Eastern Suburbs, or in any suburb across Sydney, we can come to you. We will be sure to dispose of your trash in the most responsible way possible too so that if possible, none goes to landfill. If you’re still not quite sure whether Same-Day Rubbish Removal is the service that you are looking for, call us now on 0402 737 046 to receive a quote that you will find hard to refuse.